Nationality: American. Born: Cincinnati, Ohio, 18 December 1947. Education: California State College at Long Beach, B.A. in English, 1970. Family: Married 1) actress Amy Irving (divorced 1989), one son, one daughter; 2) actress Kate Capshaw, one daughter. Career: Won amateur film contest with 40-minute film Escape to Nowhere , 1960; on strength of film Amblin' , became TV director for Universal, late 1960s; TV work included episodes of Marcus Welby, M.D., Columbo , and Night Gallery , and TV films, including Duel , then given theatrical release; directed first feature, The Sugarland Express , 1974; formed own production company, Amblin Productions; produced television series Amazing Stories , late 1980s, and seaQuest DSV and others, 1990s; formed new Hollywood studio DreamWorks SKG, with David Geffen and Jeffrey Katzenberg, 1995. Awards: David Di Donatello Award (Italy) for Best Foreign Director, Kinema Jumpo Award (Japan) for Best Foreign Director, National Society of Film Critics Award for Best Director, and L.A. Film Critics Award for Best Director, for E.T. , 1982; Directors Guild Award for Best Director, and British Academy of Film and Television Arts Award for Best Director, for The Color Purple , 1985; Irving G. Thalberg Award for body of work, Motion Picture Academy, 1986; D. W. Griffith Award, National Board of Review, for Empire of the Sun , 1987; Academy Awards for Best Director and Best Film, L.A. Film Critics Best Film, New York Film Critics Circle Best Film, D. W. Griffith Award for Best Film, and National Society of Film Critics Best Film and Diretor, for Schindler's List , 1993; Golden Lion for Career Achievement, Venice Film Festival, 1993; Life Achievement Award, American Film Institute, 1995; Distinguished Public Service Award, U.S. Navy, 1999. Agent: Jay Moloney, Creative Artists Agency, 9830 Wilshire Boulevard, Beverly Hills, CA 90212, U.S.A. Address: Amblin Entertainment/Dreamworks SKG, 100 Universal City Plaza, Bungalow 477, Universal City, CA 91608–1085, U.S.A. The Sugarland Express—Spielberg, Barwood and Robbins, Zsigmond , edited by Rochelle Reed, Washington, D.C., 1974. The Last Days , New York, 1999. Steven Spielberg Seminar , in Dialogue on Film (Washington, D.C.), July 1974. "From Television to Features," an interview with M. Stettin, in Millimeter (New York), March 1975. "Close Encounter of the Third Kind: Director Steve Spielberg," with C. Austin, in Filmmakers Newsletter (Ward Hill, Massachusetts), December 1977. "The Unsung Heroes or Credit Where Credit Is Due," in American Cinematographer (Los Angeles), January 1978. Interview with Mitch Tuchman, in Film Comment (New York), January/February 1978. "Directing 1941 ," in American Cinematographer (Los Angeles), December 1979. "Of Narrow Misses and Close Calls," in American Cinematographer (Los Angeles), November 1981. Interview with T. McCarthy, in Film Comment (New York), May/June 1982. "Dialogue on Film: Steven Spielberg," in American Film (Washington, D.C.), June 1988. "A Revealing Interview with Steven Spielberg," in Film Threat (Beverly Hills), vol. 19, 1989. "Always," an interview with S. Royal, in American Premiere Magazine (Beverly Hills), no. 6, 1989/90. "China and the Oscars," written with Kathleen Kennedy, New York Times , 25 March 1991. "A Close Encounter with Steven Spielberg," an interview with D. Shay, in Cinefex (Riverside, California), February 1993. "Chase, Crush and Devour," an interview with Stephen Pizzello, in American Cinematographer (Hollywood), June 1997. Pye, Michael, and Lynda Myles, The Movie Brats: How the Film Generation Took over Hollywood , London, 1979. Kolker, Robert Phillip, A Cinema of Loneliness: Penn, Kubrick, Scorsese, Spielberg, Altman , Oxford, 1980; revised edition, 1988. Crawley, Tony, The Steven Spielberg Story , London, 1983. Goldau, Ant Je, and Hans Helmut Prinzler, Spielberg: Film als Spielzeug , Berlin, 1985. Mott, Donald R., and Cheryl McAllister Saunders, Steven Spielberg , Boston, 1986. Smith, Thomas G., Industrial Light and Magic: The Art of Special Effects , London, 1986. Weiss, Ulli, Das Neue Hollywood: Francis Ford Coppola, Steven Spielberg, Martin Scorsese , Munich, 1986. Godard, Jean-Pierre, Spielberg , Paris, 1987. Sinyard, Neil, The Films of Steven Spielberg , London, 1987. Slade, Darren, and Nigel Watson, Supernatural Spielberg , London, 1992. Taylor, Philip M., Steven Spielberg: The Man, His Movies, and Their Meaning , New York, 1992; revised, 1994. Somazzi, Claud, Steven Spielberg: Dreaming the Movies , Santa Cruz, 1994. Brode, Douglas, The Films of Steven Spielberg , New York, 1995. Oskar Schindler and His List: The Man, the Book, the Film, the Holocaust, and Its Survivors , Forest Dale, Vermont, 1995. Ferber, Elizabeth, Steven Spielberg: A Biography , New York, 1996. Sanello, Frank, Spielberg: The Man, the Movies, the Myth , Dallas, 1996. McBride, Joseph, Steven Spielberg: A Biography , New York, 1997. Eyles, A., "Steven Spielberg," in Focus on Film (London), Winter 1972. Cumbow, R. C., "The Great American Eating Machine," in Movietone News (Seattle), 11 October 1976. Cook, B., "Close Encounters with Steven Spielberg," in American Film (Washington, D.C.), November 1977. Jameson, R. T., "Style vs. 'Style'," in Film Comment (New York), March/April 1980. Geng, Veronica, "Spielberg's Express," in Film Comment (New York), July/August 1981. Auty, Chris, "The Complete Spielberg?," in Sight and Sound (London), Autumn 1982. Turner, G. E., "Steven Spielberg and E.T.—the Extra-Terrestrial ," in American Cinématographer (Los Angeles), January 1983. McGillivray, D., "The Movie Brats: Steven Spielberg," in Films and Filming (London), May 1984. Smetak, J. R., "Summer at the Movies, Steven Spielberg: Gore, Guts, and PG-13," in Journal of Film and Popular Television (Washington, D.C.), Spring 1986. Britton, Andrew, "Blissing Out: The Politics of Reaganite Entertainment," in Movie (London), Winter 1986. Combs, Richard, "Master Steven's Search for the Sun," in Listener (London), February 1988. "Cinematheque Honors Spielberg," in New York Times , 3 April 1989. Griffin, Nancy, "Manchild in the Promised Land," in Premiere (New York), June 1989. Abbott, Diane, "Steven Spielberg," in American CinemEditor (Encino, California), no. 1, 1990. Cientat, M., "Le phenomene Spielberg ou la nouvelle cinephilie," in Cinemaction (Conde-sur-Noireau), January 1990. Torry, Robert, "Politics and Parousia in Close Encounters of the Third Kind," in Literature/Film Quarterly (Salisbury, Maryland), no. 3, 1991. Peacock, John, "When Folk Goes Pop: Consuming the Color Purple," in Literature/Film Quarterly (Salisbury, Maryland), no. 3, 1991. Greenberg, Harvey Roy, "Raiders of the Lost Text: Remaking as Contested Homage in Always ," in Journal of Popular Film and Television (Washington, D.C.), Winter 1991. Gordon, Andrew, "Steven Spielberg's Empire of the Sun: A Boy's Dream of War," in Literature/Film Quarterly (Salisbury, Maryland), no. 4, 1991. Schruers, Fred, "Peter Pandemonium," in Premiere (New York), December 1991. Davis, Ivor, "I Won't Grow Up!" in Los Angeles Magazine , December 1991. Wood, G., "On Spielberg: A Tale of Two Steves," in Cinefantastique (Forest Park, Illinois), no. 4, 1991. Green, C., and others, "Steven Spielberg: A Celebration," in Journal of Popular Film (Washington, D.C.), no. 4, 1991. Andrews, S., "The Man Who Would Be Walt," in New York Times , 26 January 1992. Sheehan, Henry, "The Panning of Steven Spielberg," in Film Comment (New York), May 1992. Sheehan, Henry, "Spielberg II," in Film Comment (New York), July/August 1992. Perlez, J., "Spielberg Grapples with the Horror of the Holocaust," in New York Times , 13 June 1993. Wollen, Peter, "Theme Park and Variations," in Sight and Sound (London), July 1993. Secher, Andy, "Directing the Dinosaurs," in Lapidary Journal (San Diego, California), July 1993. Jameson, L., "Spielberg's Theory of Devolution," in Film Threat (Beverly Hills), August 1993. Place, Vanessa, "Supernatural Thing," in Film Comment (New York), September/October 1993. Gellately, Robert, "Between Exploitation, Rescue, and Annihilation: Reviewing Schindler's List ," in Central European History (Atlanta, Georgia), no. 4, 1993. Richardson, John H., "Steven's Choice," in Premiere (New York), January 1994. Maser, Wayne, "The Long Voyage Home," in Harper's Bazaar (New York), February 1994. Gourevitch, Philip, "A Dissent on Schindler's List ," in Commentary (New York), February 1994. White, Armond, "Toward a Theory of Spielberg History," in Film Comment (New York), March 1994. Louvish, Simon, "Witness," in Sight and Sound (London), March 1994.
" Schindler's List: Myth, Movie, and Memory," roundtable discussion in Village Voice (New York), 29 March 1994. Thomson, David, "Presenting Enamelware," in Film Comment (New York), March 1994. Schiff, Stephen, "Behind the Camera: Seriously Spielberg," in New Yorker , 21 March 1994. Nagorski, Andrew, " Schindler's List and the Polish Question," in Foreign Affairs (New York), July 1994. Epstein, Jason, "Rethinking Schindler's List ," in Utne Reader (Minneapolis, Minnesota), July 1994. Lane, Randall, "I Want Gross," Forbes (New York), 26 September 1994. O'Shaughnessy, Elise, "The New Establishment," in Vanity Fair (New York), October 1994. Manchel, Frank, "A Reel Witness: Steven Spielberg's Representation of the Holocaust in Schindler's List ," in Journal of Modern History (Chicago), March 1995. Corliss, Richard, "Hey, Let's Put on a Show!" in Time (New York), 27 March 1995. Masters, Kim, "What's Ovitz Got to Do with It?" in Vanity Fair (New York), April 1995. Hartman, Geoffrey, "The Cinema Animal: On Spielberg's Schindler's List ," in Salmagundi (Saratoga Springs, New York), Spring 1995. Griffin, Nancy, "In the Grip of Jaws ," in Premiere (New York), October 1995. Piazzo, Philippe, "La peur aux trousses," in Télérama (Paris), 14 August 1996. Däuber, Daniel, "Forever Young: Peter Pan oder der Kindskopf in Manne," in Zoom (Zürich), April 1997. Biskind, P., "A 'World' Apart," in Premiere (Boulder), May 1997. McBride, J., "A Portrait of the Artist as a Young Man," in Boxoffice (Chicago), May 1997. Bart, P., "Watching Steven Sizzle," in Variety (New York), 18/24 August 1997. White, Armond, "Against the Hollywood Grain," in Film Comment (New York), March-April 1998. 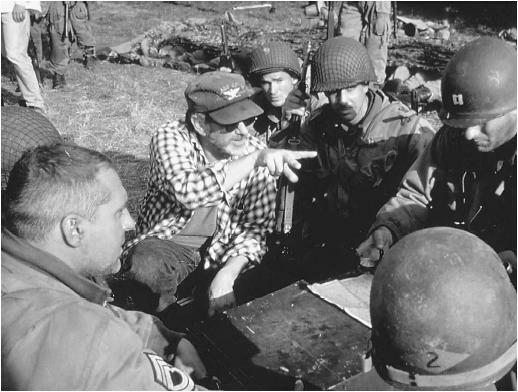 Doherty, Thomas, "Saving Private Ryan," in Cineaste (New York), vol. 24, no. 1, 1998. Perhaps any discussion of Steven Spielberg must inevitably begin with the consideration that as the new millennium gets underway after a century of cinema, Spielberg remains the most commercially successful director the world has known—an incredible, if mind-boggling proposition which, in another time, might have immediately made the director's films ineligible for serious critical consideration. Yet the fact that Spielberg's combined films have grossed well over one billion dollars attests to their power in connecting to the mass audience and offers the analyst an immediate conundrum which may take a more distanced generation of critics and filmgoers to answer fully: What does Spielberg know? And why has so much of his work invited such audience approval? Spielberg has worked in a variety of genres: the television film Duel is a thriller; Jaws is a horror film; 1941 is a crazy comedy; Close Encounters of the Third Kind is a science-fiction film; Raiders of the Lost Ark is an adventure film patterned after film serials of the early 1950s; E.T.—The Extraterrestrial is a fantasy/family film combining elements from The Wizard of Oz, Lassie , and Peter Pan; The Color Purple is a social drama; Empire of the Sun is an expansive wartime epic. And yet virtually all of Spielberg's films are united by the same distinctive vision: a vision imbued with a sense of wonder which celebrates the magic, mystery, and danger that imagination can reveal as an alternative to the humdrum and the everyday. The artistic consistency within Spielberg's work is demonstrated further by his narratives, which are structurally similar. In the typical Spielberg film, an Everyman protagonist has his conception of the world enlarged (often traumatically) as he comes face to face with some extraordinary and generally non-human antagonist who is often hidden from the rest of the world and/or the audience until the narrative's end. In Duel , a California businessman named Mann finds himself pitted against the monstrous truck whose driver's face is never shown; in Jaws , the water-shy sheriff must face an almost mythological shark whose jaws are not clearly shown until the final reel; in Close Encounters , a suburban father responds to the extrasensory messages sent by outer-space creatures who are not revealed until the last sequence of the film; in Raiders of the Lost Ark , Indiana Jones quests for the Lost Ark which, at film's end we discover is Pandora's Box of horrors when summoned up by those who would attempt to profit from it; and, of course, in E.T. , a small boy whose life is already steeped in imagination keeps secret his adoption of a playful extra-terrestrial (although one could easily argue that the non-human antagonist here is not really the sensitive E.T., but the masked and terrifying government agents who, quietly working behind the scenes throughout the narrative, finally invade the suburban house and crystallize the protagonist's most horrific fears). Structural analysis even reveals that Poltergeist , the Spielberg-produced, Tobe Hooper-directed film which relates to Spielberg's career in the same way the Howard Hawks-produced, Christian Nyby-directed The Thing related to Hawks's career, is indeed a continuation of the Spielberg canon. In Poltergeist , a typical American family ultimately discovers that the antagonists responsible for the mysterious goings-on in their suburban home are the other-worldly ghosts and skeletons not shown until the end of the film, when the narrative also reveals the villainy of the real estate developer who had so cavalierly disposed of the remains from an inconveniently located cemetery. Technically proficient and dazzling, Spielberg's films are voracious in their synthesis of the popular culture icons which have formed the director's sensibilities: Hitchcock movies, John Wayne, comic books, Bambi , suburban homes, fast food, the space program, television. His vision is that of the child-artist—the innocent and profound imagination that can summon up primeval dread from the deep, as well as transcendent wonder from the sky. If Spielberg's early films particularly are sometimes attacked for a certain lack of interest in social issues or "adult concerns," they may be defended on the grounds that his films—unlike so many of the "special effects" action films of the 1970s and 1980s—derive from a sensibility which is sincerely felt. A more subtle attack on Spielberg would hold that his interest in objects and mechanical effects (as in 1941 and Raiders of the Lost Ark ), though provocative, may not always be in perfect balance with his interest in sentiment and human values. Spielberg himself acknowledges his debt to Walt Disney, whose theme "When You Wish upon a Star," a paean to faith and imagination, dictates the spirit of several Spielberg films. And yet certainly if intellectual and persuasive critical constructions be sought to justify our enjoyment of Spielberg's cinema, they can easily be found in the kind of mythic, Jungian criticism which analyzes his very popular work as a kind of direct line to the collective unconscious. Jaws , for instance, is related to the primal fear of being eaten as well as to the archetypal initiation rite; Close Encounters is constructed according to the archetypal form of the quest and its attendant religious structures of revelation and salvation; and of course E.T. has already been widely analyzed as a retelling of the Christ story—complete wth a sacred heart, a ritual death, a resurrection brought about by faith, and an eventual ascension into heaven as E.T. returns home. If Spielberg is especially notable in any other way, it is perhaps that he represents the most successful example of what has been called the film-school generation, which is increasingly populating the new Hollywood: a generation which has been primarily brought up on television and film, rather than literature, and for whom film seems apparently to have replaced life as a repository of significant experience. And yet if the old Hollywood's studio system is dead, it has been partially replaced by a solid, if informal matrix of friendships and alliances: between Spielberg and a fraternity that includes George Lucas, Francis Ford Coppola, Lawrence Kasdan, John Milius, Bob Zemeckis, Robert Gale, Hal Barwood, Matthew Robbins, Melissa Mathison, and Harrison Ford. It is noteworthy that Hollywood, though consistently accused of a preference for box-office appeal over critical acclaim, has nevertheless refused (until Schindler's List in 1994) to valorize publicly Spielberg's work, despite his popular and critical success. The Academy of Motion Picture Arts and Sciences has consistently chosen to pass over Spielberg's films and direction—in 1975 bypassing Jaws in favor of One Flew over the Cuckoo's Nest and Milos Forman; in 1977, bypassing Close Encounters for Annie Hall and Woody Allen; in 1981 bypassing Raiders of the Lost Ark for Chariots of Fire and Warren Beatty (as director of Reds ); in 1982 bypassing E.T. for Gandhi and Richard Attenborough; and in 1985 bypassing The Color Purple for Out of Africa and Sydney Pollack. More than requiring an explanatory footnote in film history texts, these "slights" made it clear that the industry of the time had come to hold Spielberg responsible for the juvenilization of the American cinema in the late 1970s and 1980s. If the Coppolas and the Scorseses attempted to remake Hollywood to their own vision of a freer, more European, artistic sensibility (and by and large failed), should Spielberg now be held responsible for betraying earlier victories and turning Hollywood into a Disneyland? And although Spielberg became the richest man in Hollywood, the most commercially savvy, the man everyone most wanted to make a deal with, the most influential, he could not easily become anything at all like its most serious, respected artist. Spielberg's longtime insistence on avoiding adult themes, instead taking refuge in nostalgia, special effects, remakes, and sequels, seemed to be directly responsible for rather perniciously preventing non-Spielberg-like films from being produced. As well, the overwhelming number of Spielberg imitators, many producing films under Spielberg's own auspices, have largely contributed commercially successful hackwork. Hollywood noted the irony, too, that it was in the Spielberg production of The Twilight Zone movie (directed by John Landis) that two children and actor Vic Morrow should have been killed in a clearly avoidable accident in which the children's employment violated child-labor law. The Color Purple , although conforming to Spielberg's typical pattern of the hidden antagonist, backed off from an explicit representation of Celie's lesbianism, turning her instead into a cute E.T. -like creature. Thus the confrontation of the hidden antagonist (Celie's true nature) became a kind of missing climax in a film which many critics ridiculed. After The Color Purple , when receiving the Irving Thalberg award from the Motion Pictures Academy, Spielberg gave a widely quoted speech which seemed surprisingly to admit responsibility for the state of American film culture: "I think in our romance with technology and our excitement at exploring all the possibilities of film and video, I think we have partially lost something. . . . It's time to renew our romance with the word; I'm as culpable as anyone in exalting the image at the expense of the word. . . . Only a generation of readers will spawn a generation of writers." Spielberg's speech was followed by arguably his finest work: from a screenplay by famed dramatist Tom Stoppard, Empire of the Sun , set in Asia during World War II, includes some of Spielberg's most startling set-pieces (such as a crowd sequence which rivals Eisenstein's use of montage in "The Odessa Steps" sequence of Potemkin , or an unusually expressive evocation of the atomic bombing at Hiroshima), as well as more adult themes relating to war and peace, community integration and disintegration. Nevertheless, when this film was overshadowed in many ways by Bertolucci's Asia epic, The Last Emperor , Spielberg seemed to beat a hasty retreat into safer material. Always , a remake of A Guy Named Joe in which Spielberg portrayed adult relationships within a fantasy context including helpful ghosts, was both a critical and financial failure. Even more distressing was the critical failure of the 1991 Hook , in which Spielberg's professed appreciation for the word disappeared under the weight of charmless Hollywood juveniles having onscreen food fights amidst special effects gleefully presented by Spielberg as artistic entertainment. Although critics had for years suggested that the source material Peter Pan would provide Spielberg his most natural material (a boy not wanting to grow up), many were stunned when Spielberg's version finally arrived: bloated, overlong, overproduced, looking more like a vapid amusement park ride or a multimillion dollar commercial for a new attraction at the Universal Studio Tour than a film. Its artistic message—that its adult Peter Pan should work less and spend more quality time with his children—was in ludicrous contradiction to the herculean effort required by all, including its director, to devote themselves to such a high-budget, effects-heavy project; thus the film emerges as the most cynical, hypocritical attempt to play on audience sentiment to attract boxoffice in the Spielberg oeuvre. The year 1993 marked a turning point for Spielberg—with the release of two films in the same year that could not have been more different. Jurassic Park , a cinefantastique wonder showing dinosaurs wreaking havoc in a contemporary theme park, was a roller-coaster ride which fast became the most commercially successful film of all time, bypassing even Spielberg's own E.T. Although the special effects were mostly marvelous and definitely the reason for the film's appeal (can anyone who has seen the film ever forget the startlingly graceful images of apatosaurs grazing in the forest? ), many critics were startled by a certain desultoriness in the construction of the narrative: loose ends here and there, scenes which seemed not all to pay off. And indeed, deficiencies may be attributed to Spielberg losing some interest in the project—for the other Spielberg film released in 1993 was the film which would finally, irrevocably answer his critics: a black-and-white film photographed in a radically different camera style, devoid of the famous Spielberg backlighting as well as his traditional over-the-top orchestrations, using virtually unknown actors, and all on the single most unremittingly serious subject of the contemporary world: the Holocaust. Spielberg's Schindler's List was his most striking, overwhelming work; with it, he finally won his Academy Awards for film and director, as well as best film awards from the L.A. and New York critics groups, the Board of Review, and the National Society of Film Critics—a startlingly unanimous achievement. For a serious film, Schindler's List was also amazingly successful with the public, which was powerfully moved and horrified by the film. Based on the real-life story of Oskar Schindler, a German industrialist who actually saved over a thousand Jews by employing them at his factory, Schindler's List , keping with the Spielberg ethos, emphasized the most hopeful components of the story without minimizing or denying its horrifying components. The film's coda, which showed the actors along with their real-life counterparts who survived because of Schindler visiting the gravesite of the real Schindler, was criticized by some, but this strategy insisted the audience understand the story as historical and gave the film an even greater emotional depth. Although time will tell whether Schindler's List will retain its instant reputation as a great, towering achievement comparable to, say, Alain Resnais's short Night and Fog , the definitive Holocaust film, the film has—according to his own testimony—altered Spielberg's life, sensibility, and career. The first artistic work that allowed Spielberg directly to explore his Jewish heritage, Schindler's List so consumed him that he has since embarked on what he has called his most important life's work: a video project documenting the survivors of the Holocaust for educational purposes. In interviews given before his multiple Academy Award wins, Spielberg has also said that he could no longer imagine going back to directing the kinds of films he made before Schindler's List. Either Spielberg's sincerity must be regarded as suspect or his resolve as short-lived, for he followed the winning of his first Academy-award by directing The Lost World , a Jurassic Park sequel unnecessary for any motive except craven profit, in the process becoming more a designer of amusement park attractions than an artist. Psychologically vacuous, The Lost World shows men with gadgets who say things like "Lindstrade air rifle. Fires a sub-sonic impact delivery dart." The exposition is obligatory, the villains cardboard, a black Disney child improbably appears to improve the film's demographics, and characters behave stupidly so that dinosaurs can attack them. When at one point, we even see a man ripped in half by two dinosaurs competing for their dinner, we understand that the humanism of Schindler's List has been replaced by the expediency of efficient, crowd-pleasing violence: it feels almost like a pornographic vision. The few pleasures in The Lost World come from its irony—Jeff Goldblum, for instance, responding to a colleague's awe at the dinosaurs: "Yeah, 'ooh, ahhh,' that's how it always starts. But then later there's running and then screaming." A few scenes invoke Hitchcock's The Birds , generally to The Lost World 's disadvantage, but only the climactic scenes showing a tyrannosaurus rex drinking from a swimming pool in suburban San Diego evoke, through their surreal wit, any lasting sense of awe. Amistad , a noble subject in the tradition of Schindler's List , deals with the 1839 shipboard revolt of fifty-three African slaves. Despite the film's idealism and the genuine interest of its historical narrative, much of Amistad is problematic. In a surprising review in the Los Angeles Times , Kenneth Turan put forward the thesis that for Spielberg, "There's been leakage from the no-brainers to the quality stuff and . . . bad habits picked up in the mindless movies are driving out better [habits]." Turan's comments seemed shocking then, particularly delivered in Spielberg's own hometown community, and seem prescient still. Dialogue in Amistad seems incredibly stilted, as reflected in this retort to John Quincy Adams, which passes as conversational: "There remains but one task undone, one vital task the founding fathers left to their sons before their thirteen colonies could precisely be called United States, and that task, sir, as you well know, is crushing slavery." Not all performers escape seeming like high school students dressing up for an historical pageant. As well, there are conceptual lapses: the moral outrage of slavery has little to do with the thunder and lightning Spielberg uses in many of the shipboard sequences, and Spielberg's traditional backlighting—particularly during the Middle Passage of the slaves' journey—adds a sheen of romanticism totally inappropriate to his subject. Although the black slave leader's passionate outburst in court is certainly moving, that it comes after he sees a picture of Christ and that it is accompanied by a theme, which (if African) is orchestrated in the style of a heavenly choir directly out of The Ten Commandments , seem conceptually suspect, too: is it only with the inspiration of Christian myths of sacrifice that black slavescan find their African voice? These failings exist simultaneously with wonderful, expressive moments, particularly those which are silent: an ebony-muscled body framed against a black sky full of stars—an image suggesting the rapturous universal beauty of black. Unforgettable, too, is a slave mother falling backwards and overboard with her newborn baby in order to commit suicide rather than submit; even more horrifying is the sight of fifty slaves, shackled together in a line and tossed into the ocean, each one dragged by the weight of the other, as if they were only so much ballast. Although Spielberg has gotten Hollywood credit for making socially significant films, his "social" films take respectably safe subjects: can anyone be in favor of concentration camps or slavery? So far Spielberg has avoided contemporary stories of anti-Semitism, racial injustice, or social inequity which might alienate some spectators, raise controversy, or invite more ambivalent emotions. Of course, Spielberg is more interested in story-telling than in changing the world. Even in Amistad , John Quincy Adams' advice on how to win a case sounds suspiciously like Spielberg's mantra: "What is their story?" says Adams, noting that whoever tells the best story generally wins. Later, when Adams offers tribute to the leader of the slave revolt, his comment that "if he were white . . . the great authors of our time would fill books about him, his story would be told and be told. . ." itself seems a self-congratulatory pat on Spielberg's own back for being one of these great auteurs /authors. Amistad was followed by another excursion into the past: Saving Private Ryan , a war story which begins with the June 6, 1944 D-Day storming of Omaha Beach. Saving Private Ryan seems to be that rarest entity: an instant classic—particularly in its D-Day sequence, which presents the confusion and the terror, the beach running red with blood, the literal viscera of graphic violence. General audiences were stunned, and many surviving WWII veterans were emotionally unhinged. Valorizing a generation of veterans, Saving Private Ryan presents their sacrifice with great emotional expressiveness and good old-fashioned patriotism. If The Thin Red Line , the long-awaited Terrence Malick war film released the same year, was more philosophical and profound, Spielberg's film was nevertheless the more coherent story, emotionally perfectly pitched. Although Spielberg won the Academy award for best director, his film's surprising defeat for best film by the comedy Shakespeare in Love was yet another sign that Hollywood retains Spielberg reservations. And certainly critics disparaged Spielberg's framing device as unfairly obscuring the identity of the American pilgrim ostensibly telling the story—itself an unfair criticism for a rhetorical flourish totally appropriate for a story told . If the last hour of Saving Private Ryan seems like an extraordinarily good episode of the TV series Combat , even this criticism seems a quibble, because of the film's accumulating emotional power. Certainly, so many images are unforgettable: the soldier who collects dirt samples from each country he does battle in; the bag filled with hundreds of dog tags, each representing a dead American; a German soldier slowly inserting a knife directly into a GI's heart. The art design and hisorical reconstruction of the film are flawless, its final images of the D-Day battlefield absolutely awe-inspiring (even more so because we never see the beach in long shot until the battle is over). Moving, too, is the Iowa sequence showing a bereaved mother framed in the doorway, its evocation of the opening of The Searchers effortlessly suggesting that the titular search for her surviving child will be successful (just as was the search in the John Ford film Spielberg so obviously admires). Academy-award winning documentary on Hungarian holocaust survivors, his Amblin released early in 2000 the lowbrow Viva Rock Vegas , the Flintstones sequel. Reportedly, Spielberg is also currently preparing at least one more Jurassic Park sequel. Perhaps Spielberg will find some way of mediating his apparently contradictory goals with enough integrity and skill to retain his critical respectability as a serious artist, as well as his popular appeal. Spheeris, Penelope Stahl, John M.